The New Years Eve game between the Florida Panthers and Montreal Canadiens may have taken a turn for the worse for Panther’s player Krys Barch. Why? At the end of the first period of their New Year’s Eve game, the Montreal Canadiens battled the Florida Panthers around the Florida net. Montreal defenseman P.K. Subban and Florida defenseman Erik Gudbranson were both given double-minor penalties for slashing and roughing. But Krys Barch of the Panthers, rather inexplicably at the time, was given a game misconduct. 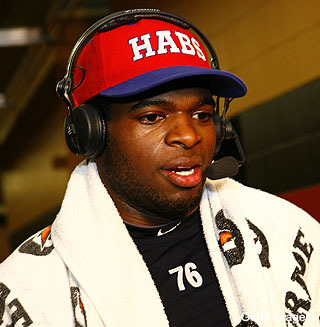 Although, Subban told the Montreal Media that he didn’t hear a slur and that no one else on his team did either. Erik Cole added that he heard something but wasn’t sure what. To paraphrase, he said it could have been something related to Subban’s parents. Now the matter is in the hands of the NHL. And the NHL Senior Executive Vice President Colin Campbell is investigating an incident from last night’s Florida-Montreal game regarding this alleged racial slur. Barch didn’t address the media following the game. On Sunday, his agent (Scott Norton) spoke with the Herald. “Krys’ commentary to me is that he did say something,” Norton said. “At the end of the day, we’re confident there will be no further punishment and he will be cleared of wrong doing and his name will be cleared. Krys is a family man with kids, his whole family is in Canada and are hearing this everywhere. It’s tough on all of them. Now, in the past this has resulted in suspension (though not recently). This is the second racially-charged incident of the season, as Philadelphia Flyers forward Wayne Simmonds had a banana thrown at him by a spectator during an exhibition game in London, Ont. in September. Was it something the linesman overheard incorrectly, or something Barch uttered in the heat of battle that he instantly regrets? If it’s the latter can the NHL even take further action without Subban or the Canadiens backing up the claim? Only time will tell us the answers to these questions. Who Will Start in the Winter Classic for the Flyers?